Parenting should be a joy. Unfortunately, many parents do not know how use authority without resorting to bribes threats, or imposed punishments. This multiple award-winning book—written for anyone working with young people—is transformational. Dr. Marvin Marshall shows how to have young people influence themselves to become more responsible by implementing three practices and by using the Raise Responsibility System. By showing how to promote responsibility—rather than aiming at obedience—you become more effective, improve relationships, promote responsibility, and reduce stress for all family members. 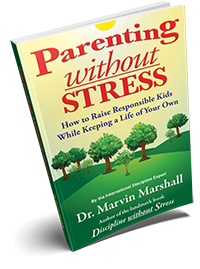 Dr. Marshall shows parents, grandparents, foster parents, and anyone working with young people how to reduce stress and have young people WANT to do what adults would like them to do. His approach is unique because it is totally noncoercive, yet not permissive. People who use his unique approach reduce stress for all involved and continually find working with young people a joy. Disagreements are easily handled, impulsive behavior is eliminated, and conflicts even between siblings are significantly reduced. What is the your approach that is so different from others? What are the three (3) procedures for having people do what you want them to do? What are some simple strategies to significantly become more effective? What do young people want but rarely receive from adults? You cannot stop emotions; however, by changing your thinking you can redirect emotions. Learn how to avoid victimhood thinking in any situation, stimulation, or urge. Self-talk creates reality and has a direct bearing on feelings. Choice ends when life ends. You are constantly making choices—both consciously and nonconsciously. Being mindful of choices significantly improves self-esteem. Learn how influencing rather than aiming to control is more effective. Discover how aiming at obedience and perfection are devastating with young people.